Somewhere underneath the geegaws is a Royal Enfield Bullet. It's a Royal Enfield Bullet, a single-cylinder motorcycle seen here with jaw-dropping modifications that make it look like a cross between a Harley-Davidson V-twin and an old American Indian motorcycle. Judging by the front license plate fixture, it's in India. While it may be painful for purists to look at, it's certainly amusing. And it proves that customizers in India are capable of anything — in more ways than one. Try to follow all those pipes; some come from the "radiator." The styling touch I can't believe is the front-mounted radiator, as if the machine had water cooling. This is the over-the-top addition that makes me think the builder has to be joking. I am indebted to reader Jeffrey Locke, who spotted these pictures somewhere on Facebook "and thought you must see this." Somehow, I can't stop looking. 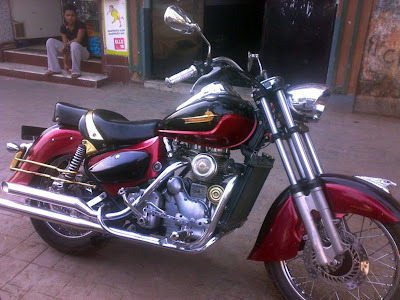 The disc brakes in front are fake too...Bullets (as all bikes from RE are popularly known) are the most modified / accessorized bikes here in India. 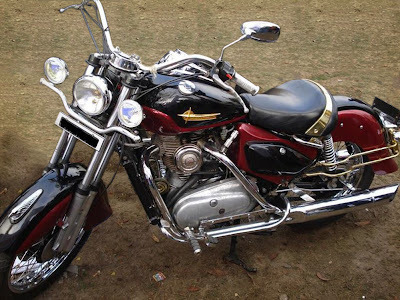 You will find many bikes which are modified beautifully and many more which are like this. It has 4 exhaust pipes? I'm so confused. The radiator and headlight scream Honda VTX. Bizarre!